Lycanite is creating Evil Monsters for Minecraft! 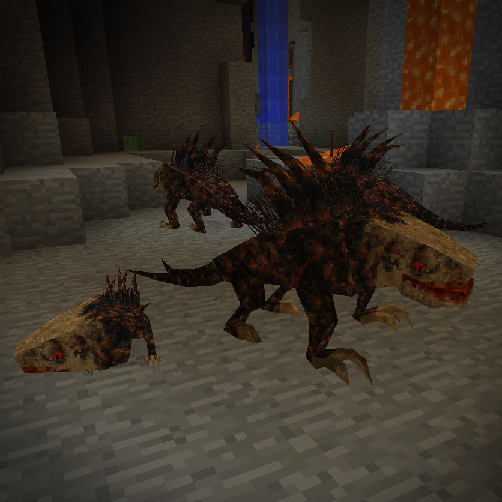 Lycanite's Mobs is a mod for Minecraft (with Forge) that adds many new mobs to specific biomes, situations and dimensions. These new mobs are mostly hostile however there are several farmable mobs and some mobs can also be tamed for battle or as mounts! Some mobs can be summoned as temporary minions too! This mod takes inspiration from other games and mythologies and is well known for it's Doom (by ID Software) inspired Demon Mobs for the Nether! Game inspirations include: Doom, Heretic, Hexen, Castlevania, Oddworld, Monster Hunter and more! Various mythologies also come into play with this mod as well as unique creations! I work on this mod adding new content almost every week, this is all done in my spare time and while I'll always aim to produce this content for free, I welcome any support with open arms! I promise to continue working on this mod the best I can! Elemental Patrons are entitled to any Elemental Creature as their familiar, these are permanent in game minions that will always be at your side as you need them! http://lycanitesmobs.com/creature/group/elemental Familiars can be controlled via the Beastiary in game. You may choose an uncommon subspecies for your familiar such as a Scarlet Spriggan or Azure Cinder too. Bosses aren't available as familiars however as they don't have the AI and are too powerful. You can also name your in familiar, just throw me a message. Your familiar may also be a rare subspecies such as Celestial Geonach (note: not all rare subspecies have been added yet, but once added let me know and I'll change your familiar to a rare if desired). You may also choose a subspecies skin, these are an upcoming feature that completely change the look and sounds of a creature while keeping the same behaviour. You absolute madman! As a massive thanks for absolutely massive support, you may choose any summonable, tameable and rideable mob as your familiar! Check out the mob website to see what can be tamed and mounted.